DJI Inspire flyaways. Is anyone surprised? – This just reinforces my statements made here: there will never be a substitution for good old fashioned piloting, no matter how advanced the algorithms are. – Multirotor makers should encourage people to learn to fly properly, especially DJI. Also, stop marketing these tools as fool-proof. We all know they are not. They will flyaway. They will crash. There is no substitue for human error and ignorance. – The need for a more education around multirotors and “drones” in general. – Also, the word “drone” implies autonomy, so “autonomous drone” is sort of reduntant, in Gizmodo’s title. A multirotor can be a drone, if autonomous, but not all multirotors are drone, by this definition. Mini racer quads are generally not “drones” by this definition since they don’t fly on their own. Don't Trust Your Expensive Autonomous Drone to Always Be Autonomous . UAV rules coming in 2017. FAA, really? Gilligan confirmed that a “balanced” proposal on drones is under executive review. But once that proposal is published for the public’s eyes, it could take months to arrive at a final set of rules. The result could mean years of additional delays, according to a Government Accountability Office official. Something needs to be done at this point. The US needs to be a pioneer in this field, but when it is basically outlawed, the innovations will simply take place elsewhere. Click below to read the full Washington Post article. The FAA won’t make up its mind on drone rules until 2017 — at the earliest – The Washington Post. Amazon has already begun exporting its research and is currently testing drones in Cambridge, England, where experimental flights don’t require a special license and pilots are only expected to follow general rules such as staying away from large crowds and airports. The UK has already issued more than 300 licenses for commercial drone use with the majority used for photography and filming. Amazon tells FAA to change drone laws or it'll move research abroad | The Verge. The sheriff noted that the ACSO had purchased a FLIR infrared camera to attach to the drone. Check out the full article below for all the details. County sheriff finally gets the drone he wanted, ignores privacy concerns | Ars Technica. What do you get when you cross and RC car and a quad? What do you get when you cross and RC car and a quad? You get this Kickstarter project, the B Flying car. The project is still far from their £25,000 goal (about $40,000 USD) but you still have until December 3rd 2014 to pledge your support. For around $700 USD, and if the funding is successful, you *could expect the own B Flying car by Mar 2015. So, what are you waiting for? Check out the project and if it tickles your fancy, whip out that credit card. 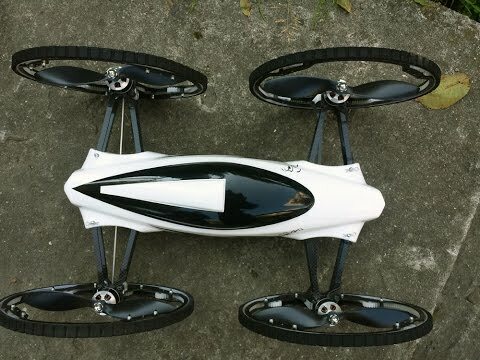 Check out this impressive project by James C, a self-designed and 3d printed quad copter frame that uses the Sparky2 board for a flight controller with an integrated Mobius camera gimbal. He details everything about the project and he even made the STL files available for free from Thingiverse so that anyone can print his frame. Here’s an excellent piece about “drones”, everywhere from the military kind, to the hobbyist type that anyone can buy at the local hobby store. Its a long read but I promise you, its well worth it. Drones and Everything After — NYMag.